Amar Chitra Katha is currently creating a new series of comics on the important Hindu temples in India. The first in the series is on Tirupati Balaji Temple. The comic book focus on the origin and the stories associated with the temple and how the present day temple came into being. The stories in the book are meant to help children understand about the world’s most visited place of worship. 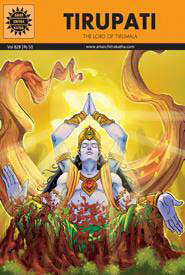 When Vishnu returned to Vaikuntha after his Krishna avatar, Brahma, the creator, began to worry about the earth. Without Vishnu, he was afraid, chaos would ensue. So he and his son Narada, the wandering sage, set in motion a plan to get Vishnu, to return to the earth. A talking anthill, an arrogant sage, an irate cowherd, and even the asura king Ravana, each have their parts to play in these stories that describe the founding of the Venkateshwara temple at Tirupati. Set amongst the lovely Tirumala hills, this temple to Lord Vishnu, is one of the most beautiful temples in the world. It is said that more than 50,000 people visit this shrine every day, to pray to Venkateshwara to wash away their sins.